We will need a completed MEDICAL FORM submitted on the first day of camp. NEW POLICY: we will no longer keep forms on file - a new form must be submitted every summer. Your PayPal receipt from Southend Basketball LLC (Tax ID 35-2353490) is your official confirmation. Refund Policy: If you are unable to attend the camp and provide 10 days notice you will receive a refund less a $100 non-refundable deposit. 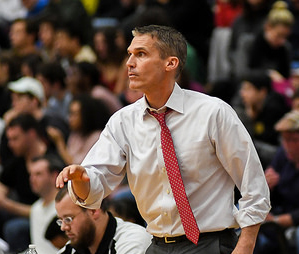 Coach Reilly arrived in the Spring of 2008 as the Head Coach of Wesleyan University Men’s Basketball. Coach Reilly’s 24 years of college coaching experience also includes eleven years as the Head Coach of Bates College in Lewiston, Maine and three years as an assistant coach at Yale University. He has over 30 years of experience as a co-director and counselor for the Joseph F. Reilly Summer Basketball Clinics founded by his father in the south end of Hartford in 1967. The clinic still runs annually every summer in Wethersfield, CT. Coach Reilly has also directed clinics in Ireland, Spain and Taiwan. • Air-conditioned Silloway Gymnasium features six baskets and two full-length regulation college courts. 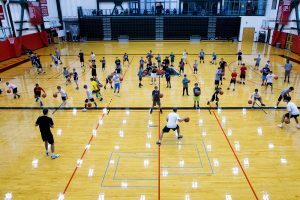 • Bacon Fieldhouse offers three regulation college courts and additional space for stations and games. Three full courts also available in Spurrier-Snyder Rink. • An energetic coaching staff will ensure that players will IMPROVE and HAVE FUN! If none, type N/A or None. Permission, Waiver, Release and Indemnity Agreement: In consideration of permitting my son to enroll or participate in the Summer CARDINAL BASKETBALL SCHOOL offered at Wesleyan University, the undersigned on behalf of his/her heirs, executors and administrators and all of the assigns of any of them, hereby knowingly and voluntarily RELEASES, WAIVES, FOREVER RELINQUISHES and DISCHARGES Joe Reilly, South End Basketball LLC and staff, Wesleyan University, its trustees, officers, agents, servants and employees (the “Released Parties”) from any and all claims, causes of action, liability of any type whatsoever including but not limited to liability for personal injury, property damage or wrongful death occurring to him arising as a result of, incidental to or related to engaging in the Activity, whether the same shall arise by the negligence of any of the Released Parties or otherwise. BY CLICKING ‘I AGREE’, IT IS THE INTENTION OF THE UNDERSIGNED TO EXPRESSLY ASSUME ALL RISK OF PROPERTY DAMAGE, PERSONAL INJURY OR DEATH TO THE EXCLUSION OF SOUTH END BASKETBALL LLC & WESLEYAN UNIVERSITY AND TO EXEMPT AND RELIEVE SOUTH END LLC & WESLEYAN UNVERSITY FROM LIABILITY FOR PROPERTY DAMAGE, PERSONAL INJURY OR DEATH, INCLUDING WHERE CAUSED BY NEGLIGENCE. The undersigned for him/her, heirs, executors, administrators and/or assigns of any of them agrees that, in the event any claim for property damage, personal injury or wrongful death shall be prosecuted against Joe Reilly, South End Basketball LLC and staff and/or Wesleyan University arising out of, incidental to or related to him and the Activity, he/she shall indemnify and hold harmless Joe Reilly, South End Basketball LLC and Wesleyan University from any and all claims, causes of action, liability, damage, cost or expense by whomever or wherever made or presented arising as a result thereof. I acknowledge that I have read this agreement, have been fully and completely advised of the potential dangers incidental to engaging in the Activity and am fully aware of the legal consequences of this Agreement. Your PayPal receipt is your registration confirmation. Please click Register Now button to complete registration and payment through PayPal.